In this issue we take the big bore blasters 666km out to Cobar and then head back at warp speed, testing out the limits on Suzuki’s Hayabusa and B-King, Yamaha’s VMax and FJR1300, BMW’s K 1300 S and Honda’s VFR1200. We see just who is the true king of the road! 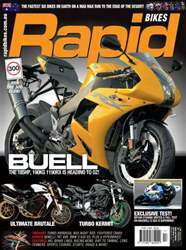 Features include a wicked turbo’d Hayabusa Streetfighter, a stunning homemade MV Agusta ‘Corsa’, a fightered Honda Hornet plus a NOS laden Harley-Davidson Night Rod. 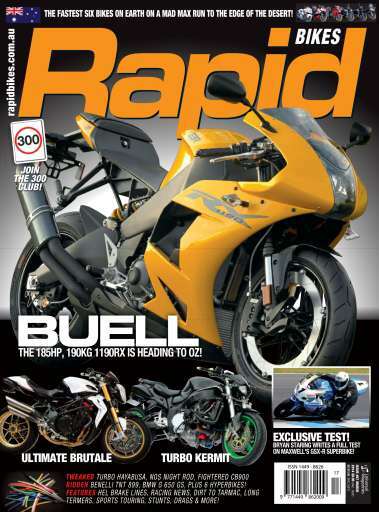 We test out Benelli’s awesome Tornado TnT 899 and there’s the latest LAMS quicktest, this time featuring BMW’s GS650. In Tech Tips we cover upgrading your brake lines to Hel braided offerings, while Workshop features the basics of reupholstering your seat. And of course all the regulars such as Flipped with Matt Mingay and ET for your drag racing fix, plus all the regular columns from Zeno, Retarded Spark and more. In the Knee Down track section you will find columns by Steve Brouggy, Remy Gardner, Andrew Pitt, Bryan Staring and exercise physiologist Emma Bailey of EJB Exercise Physiology. Bryan Staring also tests Wayne Maxwell’s 2013 ASBK winning GSX-R1000 at Phillip Island, while Neil Hodgson and Andrew Pitt interview each other and we have the latest installment in our Getting Started series with Nick Ware’s experiences moving from the dirt to track.